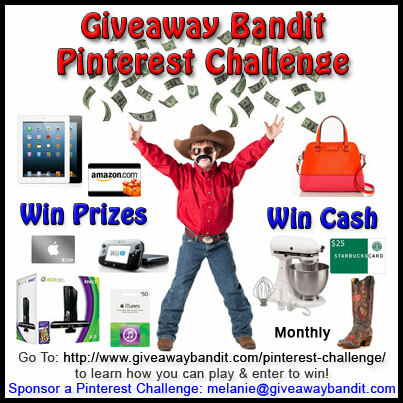 Create a Pinterest board called “Giveaway Bandit”. For the first pin onto your Giveaway Bandit, please repin this pin or pin the image at the top of the page. For the description of the pin please put Giveaway Bandit Pinterest Challenge. Enter to win cash and prizes. Pin any images from posts you like on Giveaway Bandit. It can be recent posts or posts from a year ago. It doesn’t matter. Just anything that catches your interest such as recipes, giveaways, or reviews. You must pin at least 10 images to your board called “Giveaway Bandit” from Giveaway Bandit as described above. Fill out the form with a link to your board. 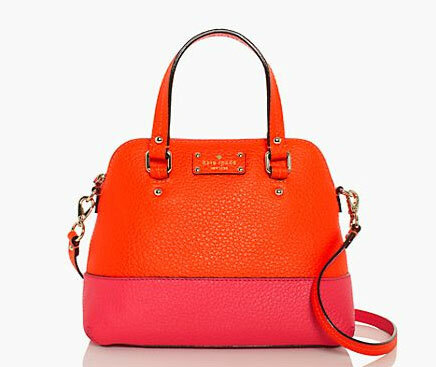 March/April Prize Our March/April prize will be the gorgeous Grove Court Maise Kate Spade Handbag. Retail value of $348. Absolutely gorgeous! This chic handheld bag is crafted of pebbled leather with an optional cross-body strap and zip-around closure. Gorgeous! Click Here for Entry Form <— You must click here, a form will come up and you must fill it out with your link to be entered to win! How to Win: Each month we will have 2 winners. We will select 1 winner with the most re-pins. We will select 1 winner for the most creative board. Each month we will start this over. Since it is mid-month right now, we will run this through the end of April and start a new one on May 1st, 2013. Good luck everyone and remember to fill out the form below and you must follow us on pinterest. Be sure you have submitted your form by April 30, 2013 at 11:59 pm EST. Good luck everyone! From the winner of the most re-pins and most creative board, we will randomly select one to receive the Kate Spade handbag and the other will receive a $100 Amazon Gift Card. To inquire about becoming a sponsor for our Pinterest Challenge, sponsor a post, or anything else, please contact Melanie at melanie@giveawaybandit.com for details. Take a look at our Media Kit to see what Giveaway Bandit has to offer. Maddie, please fill out this form https://www.giveawaybandit.com/pinterest-challenge-form/ Thanks! Thank you for this GREAT giveaway! I have completed all the tasks and will keep my fingers crossed that I will WIN this AWESOME bag! I think I completed everything. I hope I win!!! Thanks! Just wondering if there is a winner yet?!! !